Court-appointed lawyers Thursday submitted final summations for the last two defendants in Saddam Hussein's trial, and the chief judge adjourned the proceeding until mid-October when the ex-president and two top lieutenants could be sentenced to death. Saddam was not in court since his summation was presented Wednesday by a court-appointed attorney. The defense team has boycotted the trial since last month to protest the killing of lawyer Khamis al-Obeidi. He was the third defense lawyer slain since the trial began in October. The ousted president and seven others have been on trial since Oct. 19 for their alleged roles in the killing of Shiite Muslims in Dujail following an assassination attempt on Saddam there in 1982. The prosecution has asked for the death penalty for Saddam and two others. The final two defendants to appear in court for summations were former Vice President Taha Yassin Ramadan and Awad al-Bandar, a revolutionary court judge who sentenced the Shiites to death. Both defendants complained that they would not accept their court-appointed lawyers, who nonetheless presented summations maintaining that the government had failed to establish a link between their clients and the killings and human rights abuses in Dujail. "I refuse these procedures and I will not present my own defense," Ramadan told the chief judge, Raouf Abdel-Rahman. "I do not know who this lawyer is, or his name." Ramadan said he could produce "1,000 people from Dujail" to testify that "they never saw me there." He also complained that the government had done little to find the killers of the defense lawyers, adding that "if I left prison now, I could find the killers in five minutes." The judge accused the boycotting attorneys of taking money from their clients and not defending them. "They're sitting abroad now generating fame by issuing political statements on television stations as if this case is a political one. This behavior will harm you, the defendants. This is a criminal case, not a political one," Abdel-Rahman said. In his summation, a court-appointed lawyer said there was no evidence tying Ramadan, a member of Saddam's ruling Revolutionary Command Council, to the events in Dujail. "He had no role in the arrest of the people of Dujail ... There is no evidence of his involvement in the case," said the lawyer, whose identity was withheld for security reasons. Ramadan was the commander of the Popular Army, established in the early 1970s as the militia of Saddam's Baath Party. The lawyer said that even if the Popular Army were involved in the Dujail events, no evidence had been presenting show that Ramadan issued any orders. Speaking after the summation, Ramadan criticized the lawyer for dwelling so much on the Popular Army, saying his role was primarily training and he had no direct control over the units, which were under the control of local Baath party leaders. "It's not even an issue of how strong or weak my influence was over the Popular Army," he said. "The fact is, I had no control over it to begin with." Al-Bandar argued with the chief judge, who accused him of preventing his original lawyer from submitting his closing statement. 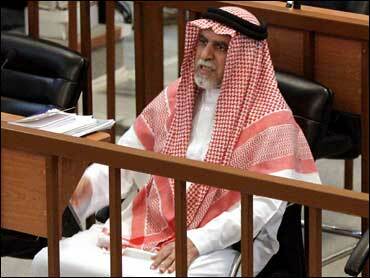 Al-Bandar then announced he was leaving the courtroom, but Abdel-Rahman ordered two guards to restrain him. "You were a judge yourself," Abdel-Rahman said. "How can you behave like that? It's not a game, it's a court." When al-Bandar objected to his court-appointed lawyer, Abdel-Rahman asked "what kind of a judge were you?" Bandar snapped back: "I was the best." The court-appointed counsel then presented a brief statement urging the court to take into consideration al-Bandar's advanced age, saying "he served the country, achieving justice." After the summations were completed, the five-judge panel adjourned until Oct. 16 to consider a verdict. Saddam is due to stand trial Aug. 21 in the bloody suppression of Iraqi Kurds in the 1980s. Following Wednesday's session, Michael A. Newton, an associate professor of law at Vanderbilt University law school, praised the performance of Saddam's court-appointed lawyer, saying his argument "was solid and based on law." "The (defense) attorney yesterday gave the best argument that could be made based on the evidence and the law and that is the essence of a fair trial," said Newton, who said he trained all the Iraqi High Tribunal judges and lawyers. Speaking to reporters at the court Thursday before the beginning of the trial, Newton described the lawyers as "courageous" and said their roles ensured "the due process of a fair trial." He criticized Saddam's original defense team for boycotting the proceedings, saying they "have an ethical duty to be in court and to be prepared to represent their clients and I believe they abandoned their ethical duty." "They should be ashamed for abandoning their ethical duty to come to court and argue on behalf of their client."